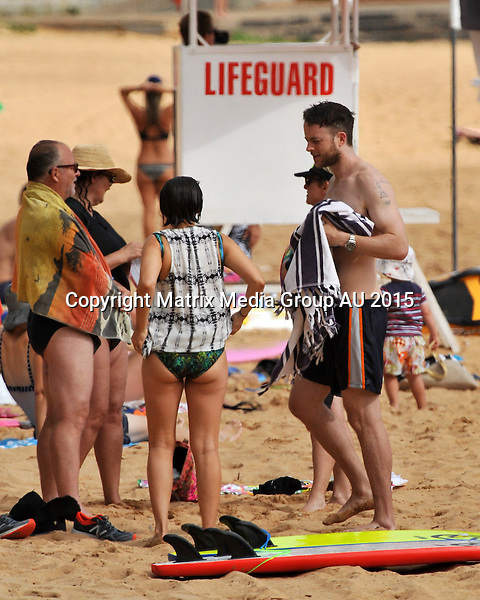 Hamish Blake pictured with his wife Zoe Foster-Blake enjoying a morning swim at Palm Beach. The couple and baby Sonny have been spending time with their friends Michael Wipfli (Wippa) and his pregnant wife Lisa while holidaying together at Palm Beach. *No internet without clearance*. MUST CALL PRIOR TO USE +61 2 9211-1088. Matrix Media Group.Note: All editorial images subject to the following: For editorial use only. Additional clearance required for commercial, wireless, internet or promotional use.Images may not be altered or modified. Matrix Media Group makes no representations or warranties regarding names, trademarks or logos appearing in the images.